The second of three installments in an ambitious biography of one of the century's most perplexing and beguiling politicians. Volume tree left off with Nixon's "last press conference" after he lost the 1962 California gubernatorial election. Ambrose sets the tone for this second book by demonstrating that almost immediately after that "farewell" to politics, Nixon began painstakingly to construct his own personal resurrection--and attained the Presidency only six years later. Those six years and the four of Nixon's first term are the purview of this volume--which, unfortunately, does not rivet the attention as did the first. Perhaps this is because in recounting the early life, Ambrose had the luxury of discovering much that was unknown about Nixon's roots. Or perhaps it is because the major focus here is the tedious explication of political positions--the endless excerpts from Nixon speeches, writings, and interviews. And perhaps it is because (no fault of Ambrose) readers may be satiated by this most written-about president--if only from the prolific pen of Nixon himself. At any rate, to veteran observers of Nixon's triumphal years, there is really very little new offered here. The author is somewhat more repulsed by Nixon ascendant than he was by Nixon the apprentice: the campaign of 1968 is described as one of the most "loathsome" in memory; Nixon's admiration for Kissinger is based on a mutual basis of "secrecy, rumor, intrigue"; Nixon is pictured as motivated by unyielding insecurity and anxiety, continually in quest of Eisenhower's illusive imprimatur. 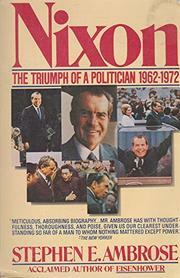 A thorough but uninspired account of Nixon's middle years. by Joseph H. Carter Sr.